A few days ago, a 37-foot sperm whale washed up in front of a resort along Babal district in the Island Garden City of Samal, Philippines. On the night of December 16, 2016, the massive mammal was seen washed up at the said beach, with blood all over the water around it. The whale soon died the following day. Cetacean expert Darrell Blatchley, who responded to the beaching, said the whale’s carcass will be transported across the Davao Gulf to the Bone Museum in Davao City. 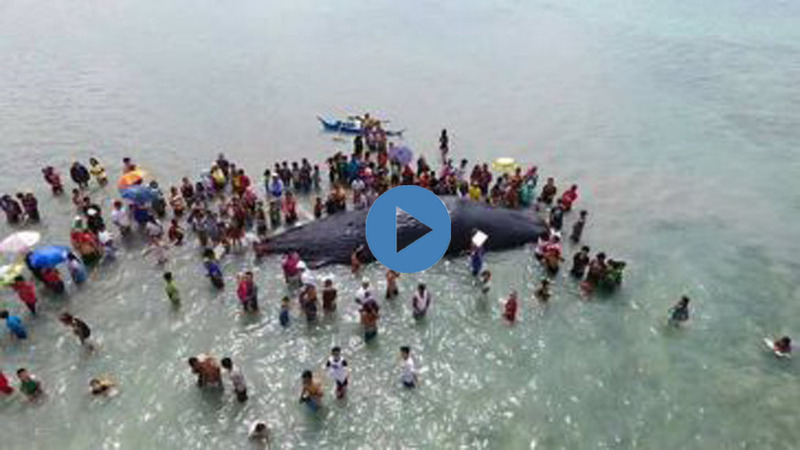 The cause of the whale’s death is still unknown, but Blatchley suspects the whale either choked on plastic trash or got injured by propellers of vessels regularly plying the Davao Gulf. Whales are endangered from a variety of threats, most of which are the direct result of human activities. In the past century, many of the large whale species were hunted almost to extinction by commercial whaling though some of those species are now recovering now the the hunts are banned in many areas of the world.